Some say, how could Jesus have tasted the second death while He never lost faith in His Father? Remember Jesus had no sense of self-preservation. The sense of self-preservation belongs to Satan. Jesus had faith, but His faith was not that He would be saved but that you and I would be saved! Jesus died the death that we deserve so that we would not have to and that we might have the life that He deserves. What "death" do we deserve that we do not have to die? Is it the "sleep" that is ended by the first resurrection? Or is it the "second death"? We may not understand how it is possible, even though William drew a good picture, but unless Christ died the second death in our place, we are doomed to die the second death ourselves. I just have to add my amen to today's lesson. This is a message that we have had for over a hundred years, and in mercy and love God is giving it to us again. I pray it moves us to greater appreciation and love for Him who died of a broken heart for us. When the soldier pierced the side of Jesus and two streams flowed, one of water and one of blood, it revealed that He died of congestive heart failure brought on by grief so deep for the sins of others He took the blame for, most of whom didn't yet even know or care that their sins were crucifying Him ("while we were yet sinners, Christ died for us" Romans 5:8). Look up congestive heart failure; it is the pleural cavity around the heart filling with water (in this case due to extreme stressfulness) and crushing the heart in agony too great to imagine, especially in this young man with a strong healthy heart. When Jesus felt his heart torn and mortally wounded by grief, while still alive he cried "It is finished". He had drunk the cup for us to the dregs. Then and only then could he rest his soul by faith alone in God. I don't want to "crucify the Son of God afresh, and put him to an open shame." (See Hebrews 6:6). God help us to glorify You in this Earth and not cause you shame. Have you ever thought of Christ being wounded again by the sins of His people on Earth as History marches on? Friends I believe those wounds in His hands still weep a little blood every day, that the sins still sting as He pleads His blood in our behalf in the Heavenly Sanctuary. His heart still aches for the lost. May Heaven help us to share His love and burden for the souls around us at work, in the home, the neighborhood. We need to be much in prayer for opportunities to tell and share with others of His matchless (Agape)Love! God help us. Consider john 16:32 & john 18:4. These passages refute all this speculation. Jesus was calling psalm 22 to mind to show that even the particulars of His crucifixion were predicted. He was continuing to encourage His disciples even in the agony of His death. Now that is love!! Jim, Psalms 22 is a real prophecy about Jesus' real feelings and emotions on the cross. THAT is love! There is no speculation to refute. The supplied Desire of Ages quote clearly says Jesus could not see through the portals of the tomb. Like Psalms 22 all Bible prophecies are very real when they are fulfilled. Psalms 22 is a prophecy of Jesus dying the second death. Jesus was not play acting for His disciples. It was all very real. William - thanks for posting my comment and even responding to it. Most sites that support the abandonment theory where I post will not post my opposing opinion. Given your view that God really did in fact forsake the Son, I can see why you read Psalm 22 with an emotional view. This is a new (and I must say creative) way to look at Psalm 22. However, the fact remains that Jesus, speaking to His disciples, said in John 16:32, "Behold, an hour is coming, and has already come, for you to be scattered, each to his own home, and to leave Me alone, and yet I am not alone, because the Father is with Me." And John 18:4 reports that, "Jesus therefore, knowing all the things that were coming upon Him, went forth,..." Put these together and we have that Jesus knew that He was NOT going to be abandoned, forsaken, or left alone "because the Father is with Me" as He went forward to meet the Roman cohort that would arrest Him. Thank you for your comment. We are always glad to publish sincere comments that are on subject. Thank you also for letting me clarify something. I do not believe that God actually abandoned Jesus. I do believe however that Jesus felt abandoned. Jesus experienced the cross as a man which is why it says in Mark 14:33 that Jesus became sore amazed in Gethsemane. His humanity was overwhelmed in experiencing something He never had had before. He was facing the death of the wicked and felt forsaken though He was not. My view of Psalms 22 is not unique or creative. It is standard. As I said in my earlier comment, the experience was real to Jesus and David prophesied of this real experience. Jesus was not just reciting verses on the cross to remind His disciples of the prophecy in Psalms 22. He actually felt forsaken though He was not. If Jesus was only pretending to feel forsaken then that would greatly cheapen the cross. Jesus was willing to die forever if that is what it took to save us. It would not be logical to think that Moses had more love and was willing to make a greater sacrifice than Jesus when he asked for his name to blotted out in Exodus 32. I hope this helps clear up any confusion. God bless and thanks again for the open dialogue. thank you for your message, i understand it so well so as with your convo with Mr. Jim and your explanation is far better to understand than his since it's really i think the actual feeling of Jesus as he died on the cross and Psalms 22 is i think the most fitted text to describe his feeling. He knows that the Father is with Him in John 16:32, yes He knows! But as you said knowing is different from feeling. and what he felt at the moment (on the cross) is not his own feeling but actually it is WHAT WE SHOULD FEEL HAD HE NOT DIED FOR US- THE FEELING OF ETERNAL SEPARATION WITH GOD BECAUSE OF OUR SINS. it was not his feeling because he had not sinned so how can he feel being separated with God? but it WAS OUR FEELINGS (all of Us) because we sinned, we are to be cursed (that's why he was hung), but he took all our curses and sins to save us (just as what atonement in Leviticus symbolizes), and the feeling of supposed eternal separation with God and man and the second death, He took them all for us (if we follow and accept Jesus we will not experience anymore the two)! And that is Great Love! an Amazing Love! that no one can ever imagine. thank you Mr. William.. God is really love! It would be good to note that, even though He FELT forsaken the next words from his mouth according to Luke's Synoptic account was, "Into Thy hands I commend my spirit." Dan, remember that Ecclesiastes 12:7 says everyone's spirit returns to God who have it. That is simply their breath and the saved and the unsaved return their breath to God. Satan has worked hard to misrepresent God's love, and taint our understanding of our love by making it look like Jesus had a hint of self interest or self preservation. The whole world was turned upside down when at the cross the universe saw God's love with no hint of self. True love can have no self in it, and a proper understanding of the cross exposes Satan's lies and lets us see the true character of God that He is love. I see what you are saying Dan. Like Esther "If I perish I perish." William, I have to believe that we as human beings with limited understanding have questions as to the fulfillment of the plan of salvation in it's entirety. We answer those questions again from a human perspective. We do not all understand why or how the same way. The insight that we have has only been available for less than 250 years. One might wonder if all those before this time would not have benefitted as much as we? I would reason that God supplies what is needed and when. You ask a question, why was Jesus crucified and cite Deuteronomy 21:22-23. I would add Jesus' answer in Matt 26:53,54,56. The bottom line is, Thank You Lord for Love that is without measure. Hi Paul, I believe the insight has been around for more than 250 years. I believe this insight is what turned the world upside down in the book of Acts, and totally changed Peter and the others. I believe it will change us too, which is why Satan wants to blind us to the depths of God's love and sacrifice. Jesus experienced the all encompassing sins of the entire human race. All the emotions of guilt, shame,and anguish were felt as if He were the One who sinned. SOP says his mental and emotional pain were so severe, He scarcely felt the physical pain.On top of that, He experienced the second death for us which meant He felt the complete abandonment of the Father. He FELT this so strongly that He couldn't see beyond the portals of the tomb. Yet He did not sin by abandoning His faith. We do an injustice to Christ when we fail to understand the intensity and the depth of His sacrifice. If I may be sufficiently presumptive to add a thought to your excellent treatise, I would say that it would be wise of us to go an extra paragraph for a greater understanding of the reason for the Godhead's valiant plan of Salvation having it's watershed at the cross and it's culmination at the re-creation of the New Earth - or, perhaps, extrapolating it to, and throughout eternity, making it a universal plan rather than just a concentrated plan to save our miserable skins. That, of course is found in Ephesians 2:1-10 with the emphasis on verse 7-10. This gives us the realization that what has been done for us in Christ has the everlasting purpose of demonstrating to worlds "in the ages ([gr] aeon) to come...the exceeding riches of His grace in His kindness toward us, for (because) it is by grace you are (have been) saved through faith..., it is the gift of God!... For (because) we are His workmanship, created unto (for the purpose of) good works...."
It will be a joy to travel about the 200 - 500 Billion Galaxies searching out other worlds in the "Goldilocks Zones" telling those who have never fallen just what it's like to experience "Amazing Grace." That will give even the retired evangelists something to do in Eternity! That was some kind of sacrifice! Praise the Lord for the insight he has given you. I had to read it twice. This is so compelling. Let the whole world know! Thanks for this message, I think worth sharing in our Sabbath school class. I understood that though there was a plan of salvation, Jesus still had the choice to fulfill it or not. It is all about LOVE. Amazing Love! Thank you all for your comments on the question as to wether or not Christ was forsaken by the Father at the cross. It has helped me to clear up this in my mind. I think, under different aspects both holds true. On one hand, Christ was not forsaken by the Father or else the spirit of God would not have raised Christ from the dead, and Christ would still have been in the tomb up to this day (Romans 8:11). On the other hand, Christ suffered the experience of being forsaken by the Father as he tasted death for all sinners taking their place (Hebrews 2:9). The word tasting indicats his experience of bitternes pertaining to this kind of death no man has ever experienced and will ever experience. Every one of us dies for our own sins. But the sins of all were placed on his head, which finally crushed his life. This is not all that can be said: It will take all eternity to ponder about his being forsaken and not being forsaken. As to now, it all leads us to adoration and worship (Hebrews 1:6). Winifred, I hope that you misspoke when you wrote, "Every one of us dies for our own sins. But the sins of all were placed on his head..."
If we die for our own sins, the indication is that we have not allowed Him to carry our sins. So I see a dichotomy in your post. It is a redundancy if both He and we carry our own sins. If we have claimed His blood, we have accepted His grace and forgiveness and the guilt of our sin is placed on Him as our substitute. We then stand before God as though we had never sinned. Dan, thank you for your note. It helps me to be more precise next time. Saying, every one dies for his own sins, I had in mind the biological death followed by a funeral service. In the next sentence I was thinking of the substitutionary death of Christ on our behalf as all our sins were placed on his head, which crushed his life. I could have added: Accepting his imputed righteousness as a free gift and partaking of his imparted rightousness will give the assurence of of eternal life. The problem seems to be as to what is in the mind of a writer and how does the reader understands the outflow of invisible thought seen in visible print. I also freely admit that thinking across a foreign language barrier can also lead to a misunderstanding. Thank you for your information which, I hope, will help to clarify the issue. I can't count the times that my fingers work slower than my brain. Then there are time that the converse occurs. That part is frightening! When I write a Blog I usually have my wife proof it to ascertain for certain that it makes sense. You are right on! - Keep on! When we put on Christ,s robe of righteousness we guaranty to not be "forsaken". Hello brothers of the United States! This was one of the best texts I've read on this site! William Earnhardt was blessed by God for writing this text with so many important details, demonstrating the tremendous love of God for us! Jesus took seriously the example of "let him deny himself and take up his cross and follow me." Greetings from São Paulo / Brazil !. Thank you for this insightful, well written discussion of Christ at His death. It has given me a deeper understanding of Christ's love for humanity. I had often wondered why He questioned "...why have You forsaken Me?" when in His ministry, said He would raise up, and, rebuild the temple of His body. I thought He knew He would rise again and that to some extent, that knowledge gave Him courage to continue His journey to the Cross. Thank you for sharing your understanding. I have been blessed. Thanks for the great lessons expressed here by everyone. In the case of substitutional sacrificial lamb, it was natural that it was fully subjected the full sting/ pain of death in totality, and for Christ there were no exceptions, worse still to bear the guilt of every sinner, must be overwhelmingly heartbreaking indeed. Most psychologist are able to explain what grief is all about and how to deal with it, it might be true with you and me too in many other circumstances, but as for the psychologists what they lack is their own personal experience, they might have never lost their most beloved one. When tragedy strikes one is now able to appreciate the difference between knowledge practice and feeling. Here Jesus was totally left to face sin and death in human flesh, no wonder He felt forsaken by the Father, but still with faith, hope and knowledge had to go on and declare "it is finished", the penalty for sin is being fully paid, at the cost of sacrificing self "AT ALL COST" for the sake of others. 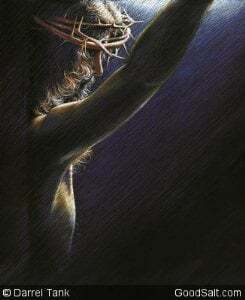 Praise God for His amazing love and amazing sacrifice, glory to the lamb of God. It will be an agonizing experience for all of us as we witness the billions surrounding the New Jerusalem at the moment they realize their hopelessness. Having the mind of Christ we will feel the utter pain of Christ as He faces that 'strange act' where He must finally eradicate those who He created, and died for. I cannot possibly imagine living a moment without any hope. The anguish that Jesus experienced for us we will ever need to, thank God. Hope is a wonderful gift. I never quite understood the faith of Jesus, before reading these posts. The difference between having a knowledge of the truth and submitting our feelings of fear, to a trust in what Christ has promised us. This is the faith of Jesus. And how wonderful that the Holy Spirit will enable our faith to grow until it is as strong as Christ's was. The paradox of Christ feeling abandoned by God, but having the faith to trust that God would not abandon Him, will indeed be our study throughout the ages. What a wonderful future Christ wants to give us! And it starts as soon as we entrust our hearts to Him! Absolutely beautiful. I read Psalm 22 carefully and it is a Psalm of assurance that yes...God is great and there are no if's, but's or maybe's regarding Gods delivering power. Its a Psalm that positively says, "YES God WILL deliver!" just as he has done so in the past. Amen.